Now that Spring has officially arrived, it won't be long before it will be Summer and time to make final plans for attending the Grissom Family Reunion on Saturday, August 4 at noon at Henry Horton Conference Center in Chapel Hill. Many of us will be spending the week before wandering around Tennessee, seeing the sights and acting like tourists. As your chairman, I have been working at putting together a schedule of group events for July 31-August 4. Sure hope you will be able to join us for some or all of the fun. I have tried to select a variety of events so as to suit many tastes. One item, namely the Grand Ole Opry, needs your immediate attention since they tell me tickets sell out fast. Some of us have already ordered ours. Later on I will figure out times and directions, but this is enough for now. Hope you like what is planned! See you in about 4 months! Cumberland Caverns Tour in McMinnville - in the morning �$10 for adults and $5 for kids. Wear comfortable shoes. Tour takes 90 minutes. It's cool inside! Lunch at Charlie's Memphis-Style BBQ in McMinnville � Recommended by Julie Swoape, they've got a full BBQ menu, plus steaks, sandwiches, and dessert's "to die for." And it's co-owned/operated by Pat Grissom Young. Tennessee Valley Cheese Store in Morrison - Cheese manufacturer with a viewing room and a retail store. They have a full line of domestic and imported cheeses and tasting is free. Nashville Shores Water Park � Water slides, Play Boat, Beaches, Wacky Pond, Ball Crawl, Paddle Boats, Jet Skies, Parasailing, Volleyball, Pontoons, Mini-Golf, Lake Cruise, Suntan Lagoon. Adults $16, Seniors and children 3-12 $14, Children under 2 free. Lunch on your own. Opry Mills Mall/Entertainment Center � Nashville's newest destination for shopping and entertainment� combines 200 outlet, discount and specialty retailers, themed restaurants and entertainment venues. Lunch at "Alabama Grill" in the mall. Titanic - The Artifact Exhibit � Just down the street from Opry Mills at the Opryland Hotel is this walk-through exhibit, recommended by Karen Rigsby. It takes about 45 minutes to an hour, and tickets are $15 for adults and $10 for children. They take a group in every 30 minutes from 10:00 AM to 9:00 PM. Click here for more details. "They have taken actual objects from the ocean floor. There were things other than the artifacts, too. They had an iceberg the temperature of the water so you could feel how cold it was and they also had some replicas of some of the staterooms. They had pictures and quotations, and they gave you a "boarding pass" with a name of a person on the Titanic as you "boarded". Mom, Dad, and I were all first class passengers. At the end, they have a "saved" and "lost" list, and we found out that Mom and I made it and Dad died." Night Life at Hard Rock Caf� � Legendary Rock 'N Roll Restaurant. Immortal tunes and classic all-American chow from burgers to apple pie. See world's largest collection of rock memorabilia. Wild Horse Saloon is nearby. Experience Nashville after dark. Saturn Auto Plant Tour in Springhill - in the morning � the tour is free but no free samples. Canoeing on the Duck River, Chapel Hill - in the afternoon � a good way to cool off. Auto Races at Twin Fountains, in Deason - at night � a trip to Tennessee is not complete without a trip to the track. Maybe some of our kinfolk will be racing. 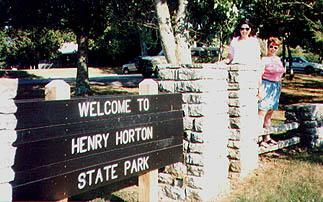 Henry Horton State Park in Chapel Hill � (Visit their website.) We will meet in the Conference Lodge, which is a separate building back by the tennis courts and pool. They promised we could have the whole place to ourselves with a catered meal and our own private buffet. Can't wait to see YOU there! Dinner will be about $10 for adults. Grand Ole Opry in Nashville 6:30 PM Show � At the Opry House. Tickets $25 Kids $15. It is up to you to get your own tickets. Order them NOW at (615) 889-3060 or online at www.opry.com click on "retail". Housing Information - Out-of-towners may stay at the Henry Horton State Park Inn. Rooms with 2 double beds are available for $64 per night. We have reserved 8 rooms for Tuesday through Saturday (July 31-Aug. 4) and one suite for our group for Friday and Saturday (Aug. 3 & 4) night. Reservations should be made through me. Let me know if you want one of the saved rooms. There are no motels in Chapel Hill and other motels are far away. Remember to contact me if you have any questions at 1631 Amelith Road, Bay City, 48706-9378 or reach me by telephone 989.686.0418 or e-mail me at corrine@imagrissom.com. Do I have all the correct addresses? Love to all � We are the Grissoms.